COMBO INJECTABLE THERAPY – treats both types of wrinkles – Static and Dynamic. 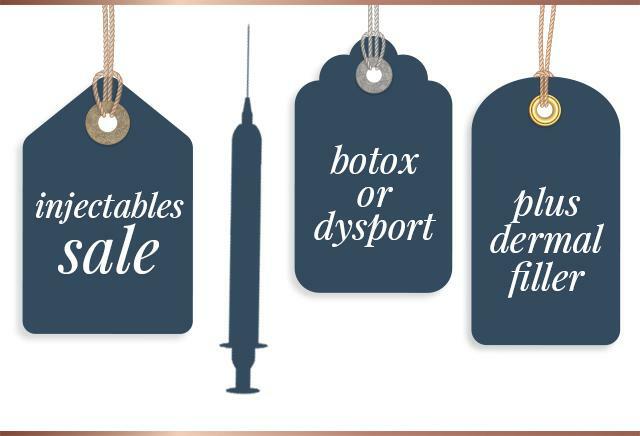 with any full syringe of our dermal fillers and receive $150 off. Why does treating your wrinkles with two types of injectables offer you the best outcome? Botox and Dysport treat wrinkles created by muscle movement – think frown or smile lines - and dermal filler treats wrinkles caused by loss of collagen and fat, and by gravity – think lines around the mouth. It takes a medically-trained injectable master with experience, knowledge of face musculature, and esthetic artistry to beautifully combine these two therapies. Make an appointment for a complimentary consultation with our expert injectors. One per patient. Expires 4/30/19. May not be combined with any other offer. Restrictions may apply. A complimentary consultation is required if any of these products is new to you.